Stealing from the common folk had never attracted Fredrick. This was partly because he had once been one of the common folk, but also because the common folk rarely had anything good on them to steal. The rich and famous, they were Fredrick’s preferred victims. At the Altador Cup, they were so neatly separated as well. Normally, Fredrick would have needed to follow them, to gradually force his way into their lives. Here, during the tournament, they were all gathered in the VIP boxes. All he needed was entrance. One quick dart into an alleyway later, Fredrick the shadow Ruki disappeared from Neopia... and a starry Quiggle appeared in his place. A briefcase, Fredrick’s only possession in the whole world, contained a myriad of small vials. He selected the correct one, and drank the contents. The transformation was almost instant as his features mixed and blurred. Fredrick’s poor victim had provided him with a ticket to the tournament. With it, he got into the cheap seats. He needed to rely on his own talents to get further. The blue Bruce stroked her fur coat elegantly. “Oh you are just the living end!” she laughed, gently patting the arm of a Gnorbu who had just told a joke. “We should do dinner, Miss Tobik,” he replied. Around her, Neopian high society buzzed. King Kelpbeard discussed high points of his life with Prince Jazan. The millionaire Spectre was sharing an amusing anecdote with King Skarl. Miss Tobik prided herself on being at the top of the tree, so to speak. Her place in one of the best boxes at the Altador Cup was evidence enough of this. “Hey! Let me through!” a voice from the entrance to the private box shouted. “No pass, no admittance,” a Grarrl in a suit growled. “Do you know who I am?” the voice demanded. Miss Tobik strained to hear more without turning her attention away from the Gnorbu. If someone uses a phrase like that, they are normally rich enough to buy the country you live in. In the entrance, a starry Quiggle in a glitzy blue jacket frowned at the Grarrl. The Quiggle produced a magazine and thrust it in the Grarrl’s face. An image of the superstar was on the cover, grinning for the entire world to see. The whisper went around the room like wildfire. Never one to miss an opportunity, Miss Tobik left the Gnorbu and marched over to the Grarrl. She smiled sweetly at the Grarrl. “Alright, Miss Tobik,” he grunted. The Bruce took the Quiggle by the arm and escorted him back towards the Gnorbu. “I was just saying to Mr. Stevenage over here that the world needs more singers!” Tobik laughed. The Gnorbu nodded in acknowledgement. “What’s it like to be on stage, Mr. Clacks?” Tobik asked, enthralled with the newcomer. Tobik did not notice as Rodney silently put his hand in her pocket, and spirited away the contents. “Oh, of course! We are all slaves to our publics!” Tobik joked. Over the next hour, Rodney was introduced to the rest of the room, carefully escorted by Miss Tobik. It didn’t matter that there was no Rodney Clacks or a band called Clacks and the Clocks. No one asked, no one dared to admit that they’d never heard of anyone who was clearly as famous as he was. Gradually, Fredrick, in the guise of Rodney Clacks, filled his pockets with gold. Rings taken during handshakes, pocket watches carefully lifted while their previous owners took a swig of their drinks... purses, necklaces, everything and anything. Eventually, the affluent and illustrious were seated, and the opening ceremony began. The teams emerged to the sound of thunderous cheering from the fans. The applause and cheers rose louder, blocking out all other noise. In his ear, Rodney heard someone whisper. “I’m on to you,” the voice said hoarsely. Rodney turned his head, but there was no one. “Is something the matter?” Tobik asked. “No... no, not at all,” Rodney replied, turning back to the festivities. The Cup began. Teams fought each other. Some lost, some won. Fredrick wasn’t bothered either way, he was barely paying attention. Of course Rodney loved the sport; he’d played it as a child. He was an avid Meridell fan, and knew statistics about each team member. None of them were true, Fredrick made them up... but no one knew any different, so his word passed as law. He had the entire box eating out of his hand. The day’s matches ended just before sunset. “I’m throwing a little soiree later, will you be attending?” Miss Tobik asked as the crowd filed out of the private box. “I wouldn’t miss it for the world,” Rodney replied. “Oh good! I’ll make sure to check that your name is on the guest list, to avoid the unsightly problems you had earlier. Ta-ta!” she said, waving her hand regally as she left. There was a Yurble leaning against the wall in a long trench coat. His dark green fur was contrasted by the whites of his eyes. His smiled politely. “Can I help you?” Rodney asked. Fredrick already knew this conversation would end badly, he just wasn’t sure how badly. Fredrick cursed himself. Why had he picked Meridell? The Yurble showed Rodney the magazine. Where on Rodney’s forged copy there was a starry Quiggle, on the Inspector’s there was a picture of a Maraquan Bruce. “There is no Rodney Clacks, is there?” the Inspector asked. “I haven’t blackmailed anyone,” he said truthfully. The Inspector looked at him thoughtfully. “So you’re taking me in?” Fredrick asked, holding his arms out for the cuffs. “I’m not a private investigator!” Fredrick shouted. “Suit yourself,” Greenbolt replied, producing a pair of cuffs. “Wait! Wait... I’ll do it,” Fredrick decided. He smiled pleasantly at Fredrick, before leaving him alone in the private box. Fredrick paced back and forth anxiously. How do you find a blackmailer in a city? Greenbolt had said he thought it was one of the people in the private box... but how could he be so sure? It could be anyone... a random fan who won the lottery, a player, even a member of the Altador Council. How do you find a needle in a haystack? Oh, everyone complains that it’s difficult, but why has no one ever sat down and done it... and then told others how to do it? “Your room is ready, sir,” the receptionist Bori announced. Fredrick returned from his own thoughts, and it took a few moments before he remembered he was in a hotel. “I didn’t ask you for a room yet,” Fredrick told her. “A Miss Tobik told us to expect you; she will take care of the bill, sir,” the receptionist explained. Fredrick smiled. Tobik had fallen for the act, hook, line and sinker. He allowed himself to be shown up to his room, and tipped the bellboy with a stolen ring. Alone again, Fredrick returned to his thoughts. He’d investigate the teams tomorrow... now he had a party to attend. Hopefully, some of the guests would provide him with clues. For around 500 neopoints and a trip to the Cooking Pot in Mystery Island, you could have something new to eat. "Mummy, I'm going to play in the woods!" Clover shouted as she closed the gate behind her. 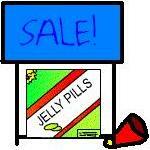 GET YOUR JELLY PILLS HERE!! !